Furianne: Blogmas - December 19: Bah Humbug! Michael was up and he had some stuff that we needed to talk about so we talked for several hours. In the middle of that I took some time to drop off some packages at the post office. When I got back we video called and he showed me how he had set up his gaming computer. By the time he went to bed it was 11:30. By that time I was feeling pretty groggy so I thought it would be wise for me to go to bed as well. Unfortunately Rachel decided to start vacuuming 15 minutes into my sleep so I gave up. Instead I figured I should eat. I had half a can of some potato soup. I tried to eat more but my stomach couldn't take any more. I credit it to my lack of sleep. After that I took some pictures of my Sniff My Tarts haul, then get to cleaning my room. While I was cleaning, Dad decided to start a fire and he called all of us out to sit around it. While we were out Rachel, Will and I played some tag and also hid from the dogs. The dogs aren't very good seekers :) They like following us but they don't really care to find us. At one point Dad decided to clear a pile of wood that had a bees nest. We felt bad as we were finishing up throwing the wood into the fire because the bees were really docile, revealing that they were not Africanized. Dad doesn't want the hive to potentially be taken over, though, since we are in an area that has killer bees. 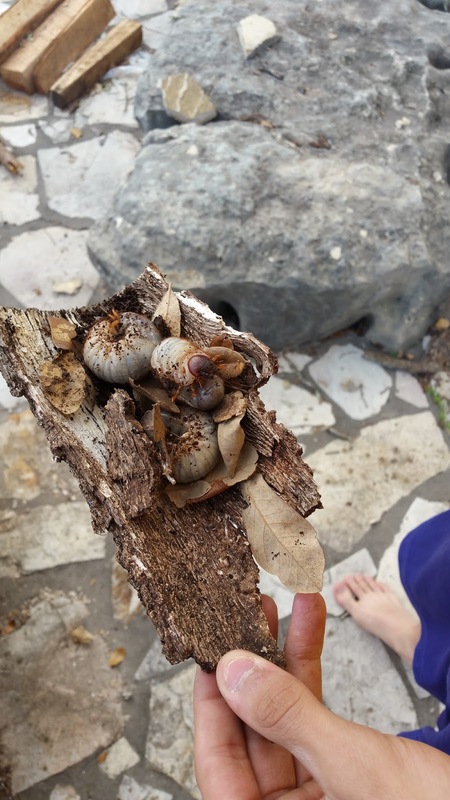 While clearing up the wood Dad noticed some really large grub bug thingys that are bad for tree roots. So... we cooked them. In the fire. There were dozens. Dad got upset that he had let it get so bad and wondered how the cluster of trees still looked so lively. At one point us kids tried to sneak back into the house. I went to my room so I could sleep, and I dunno what my siblings did. Dad came in and told all of us to come back out. I was very grumpy at this point and voiced my objections. He told me to bring out some pillows and blankets and sleep out there with the family. I wouldn't mind that normally, but something about today has me super sensitive to sounds and unable to fall and stay asleep when around them. So... I spent a lot of time being a grumpy grinch on the ground by the fire pit. After a while Dad decided that we could all go in and we would resume more fireside time later, once the sun had gone down. I took that opportunity to sleep! I slept for about an hour, then woke up very suddenly and with my heart racing and adrenaline pumping. I still don't know what did it. So I video called Michael to wish him a good morning and then set off to make some soap! The soap started off great! This time I was going to do another tricolor drop swirl, and I only did a 50% substitution of goats milk for water. The goats milk ended up a little more yellow than it is when I freeze the milk since I decided on goats milk at the last minute and did have any already frozen, but it was still a great color. The Tussah silk fibers dissolved well, my colorants looked awesome, and I was using a recipe that I've come to like that has a slow trace. I added the fragrance oil and gently whisked it into my batch, then got ready to split it into three. Half way through pouring off my soap the batter got very, very thick. So I started hurrying with adding in my colorants. It was a disaster. The soap just kept thickening up and I was getting more and more desperate to get the darned colors mixed in and the soap poured into my mold. Only it was far too thick to pour into the mold. I had to scoop it in. Plip plop. Only the soap stayed in hard balls and did not want to fill every crevice of the mold. By the time I got to my third color the soap was too hard for me to fully mix the color into. So half of that last color is actually uncolored soap chunks just thrown on top of my loaf. What was supposed to be a drop swirl ended up as a very sloppy three layered look that was very grainy. I would say my soap riced a little. So I put the soap in the oven so it could gel and sat myself down in an unhappy mood. I was so excited for another swirly soap! Not to mention I could no longer pick out the scents that I had loved so much in my mix before I added it in. It was overwhelmingly cucumber melon, and that was the fragrance I used in the smallest amount! To pep myself back up I made some cookies. The soap took about an hour to fully gel, and even then I'm not sure it finished. The texture was really hard to figure out for me. In any case it's sitting on the counter downstairs waiting for me to check it out in the morning. The cookies turned out good. I only had one though. I'm still wondering why I'm not eating as much as I normally do. The only difference between today and yesterday is sleep so I'm still sticking to that story. After the cookies finished I left them out to cool and finally joined the family around the fire. We spent a few hours doing our silly family stuff we always do, being silly and recounting fun family times while trying to steal all the blankets from each other. When the fire died down Dad decided that he wasn't going to add any more logs and we got ready to head in. I went up and got to working on this blog post! While I was doing that Michael video called me and showed me some nice views that he found while walking around the city. I didn't think it was possible but I keep getting more and more excited for going over there. Anyways, I wouldn't say today sucked. It was quite nice, actually. But I had some pretty grinchy moments and things that added to my grinchiness. Two soap batches in a row now have gone wrong in one way or another. I am disappointed. The good thing is I'm fairly certain I know what went wrong with each batch so I just need to keep that in mind when working on my next batch. Off to bed for me. I can barely keep my eyes open! Have you had days where no matter how exhausted you are you just cannot sleep? Well poo for misbehaving soap batches! There are some nights where I wake up and just can't fall back asleep, or I only sleep in short little 15 minute chunks and keep waking up. Everything about me wants to fall back asleep but it seems like I just physically can't. Like, I have to keep repositioning constantly. Drives me nuts!